William Knight doesn’t belong in Trinity Boys College. He is bullied constantly and is always wondering why he doesn’t fit in. When he is suddenly whisked away from the human world to the medieval village of Chermside by a talking dragon, he is given a deadly task only a true knight can achieve. The task? Rescue the queen from a dungeon, win his knighthood, kill the king who murdered his father and return the town to its former glory before the dark magic of the king ruins the beautiful town forever. To make matters worse, he is expected to undertake this deadly quest with a conceited boy named Thomas Knight; his brother. Could things get any worse? It’s my absolute pleasure to present my last review for 2014, which is for a children’s book which I thoroughly recommend. Not only is Michelle a good friend, she is also a talented author and with Wolfbaene, she has chosen to donate all profits to the Princess Margaret Hospital – so it’s well worth buying a copy for yourself! Many, many years ago, as a child, I read the works of Enid Blyton, and adored them. I enjoyed so many elements of the adventures in those stories. Ms. Dennis has captured that same sort of rollicking adventure, and transported me back to my childhood, providing me with a thoroughly enjoyable few days of reading. The story follows William Knight, a young man who attends Trinity Boys College and is constantly bullied. 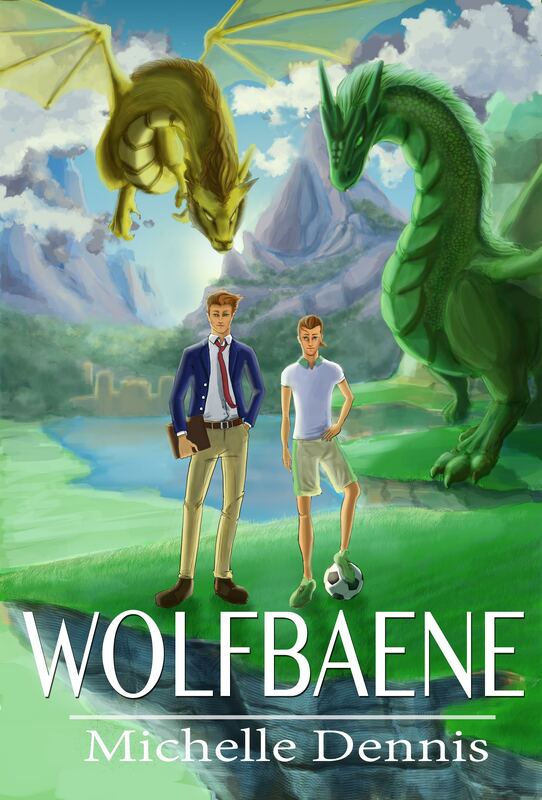 He finds himself transported by a talking dragon to the medieval village of Chermside and from here, the story takes off in an imaginative, fast-paced and entertaining arc which was thoroughly delightful to read. William discovers that he is no ordinary young man – in fact, he is the son of a King, and his mother has been imprisoned by the evil usurper to the throne. William not only discovers that he isn’t an orphan, as he originally suspected, but he also has rather overbearing, arrogant and annoying brother, Thomas, whom he has to deal with, along with getting used to a strange new land and many new people. The story follows William and Thomas’s adventures as they come to terms with the fact that they alone can save Chermside from the evil King, and it was enjoyable to see how their characters grew and evolved as time passed. Whilst William fears he isn’t strong enough, or brave enough to complete the tasks given to him, the author has given us a hero who is both believable and lovable and it was great to see him express his fears and concerns so honestly and realistically. Thomas (whilst annoying) proved himself to be enjoyable to read about, and I’m certainly looking forward to discovering what happens in the continuation of the story, which the author is currently developing. Ms. Dennis proves herself as an excellent author of children’s literature in this debut novel. Highly recommended for an enjoyable reading experience with your younger children, or as a book your older children can read for themselves. There are some minimal issues with punctuation and grammar, and I noticed a couple of words in which the incorrect spelling was used for specific meaning, but overall, this didn’t detract from the reading experience. Thank you so much for this awesome review. While I wish there weren’t errors in my debut novel, I am grateful to have been able to bring this adventure to readers like yourself, and especially childten. This is a lovely New Year gift! P.S I’m hoping you’ll be editor next time around. I’d love to help out, and I’m glad you liked the gift. Sorry, had to mention the typos, always do because I think its important to let readers know I was aware of them, but still had to give 5 stars because the story was excellent!